Since we were officially off the Adventure Cycling route, Matt printed us a series of maps to get us back on track. He noted areas that might be tricky for us to navigate (like around the huge port). But he’d ridden and driven most of the roads on his suggested route and assured us that the route was safe and easy to follow. After leaving Palos Verdes, we’d skirt the Port of Los Angeles and the Port of Long Beach, the busiest container port in the United States. Once we got to Long Beach, we’d pick up the Adventure Cycling route again. Seemed straightforward enough. We’re seasoned urban riders and weren’t too worried about navigating the area around the port. We stopped several times to check our maps against our phone GPS to make sure we were still on track. At one of these map/GPS checking spots, a LA Fire Department ambulance pulled up to us with its lights on (thankfully, no sirens!). Two firefighters hopped out and asked if we were lost. A bit flabbergasted by their kindness, it took us a minute to figure out why they stopped. We told them we were fine, just checking our maps and trying to figure out where we were so we didn’t miss any turns. They chatted about our trip, they were both curious about our adventure. When we told them we were from Seattle, they must have thought we were naive small-town folk lost in the big bad metropolis. We eventually realized they were concerned for our safety when one of the firefighters called the neighborhood “rough”. I asked him to clarify — did he mean the pavement, the truck traffic or something else? He didn’t use the words, “bad part of town” , but I assumed that’s what he meant. The firefighters helped us figure out the next couple miles of our route and told us not to stray off the route Matt gave us, again using the word “rough”. I have a healthy imagination and at this point I was picturing the worst scenarios playing out: lost in a bad part of town, held up by bad guys, bike-jacked by thugs. Or worse. I wasn’t really scared but I’ll admit I let my mind conjure up some potentially bad scenarios. Tim assured me we’d be fine. And even joked about my bike-jacking worry. He said at this point, he’d gladly give up our bikes, bad guys wouldn’t even have to steal them, he’d hand them over! At least losing the bikes would give us a reason to rent a car and drive the rest of the way to San Diego. Jokes aside, we picked up our pace, pedaling through the next section of the route as fast as we could and staying aware of our surroundings. We were relieved when we joined the bike path that ran along the Los Angeles River. 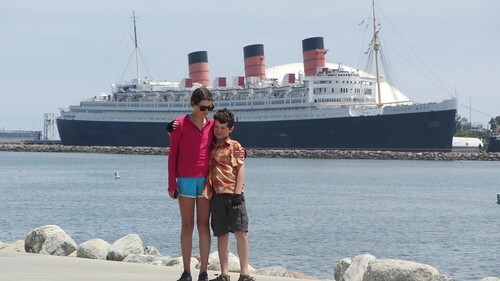 We followed the path to a nice little park in Long Beach with a view of the Queen Mary. We decided it was the perfect spot for a lunch break. We were a little too leisurely with our lunch and realized we’d been there a long time and it was getting late. We needed to get back on the road. After snapping a few photos, checking out the park and figuring out the route for the next few miles, we were on our way again. The park would have been a nice place to take a nap on the grass and stare up at the clouds. But we didn’t have time for napping or cloud gazing, we really had to get going. The next section of the route was super busy and traffic clogged. As the Adventure Cycling route states, the car is King in SoCal. We rode defensively the entire day, pulling over and getting out-of-the-way when necessary. The “Share the Road” type banners have a different message in Newport Beach. They read “Same Road, Same Rules” which we interpreted as a tad passive/aggressive and possibly aimed at scofflaw bicyclists. Are we being too sensitive? What do you think they mean? We followed Highway 1 through Huntington Beach, Newport Beach/Corona Del Mar and Laguna Beach. Lots of beach names, but what I really remember was all of the cars! And all of the traffic. The farther south we ride, the more our family bike discount argument is falling on the deaf ears of CA State Park employees. The parks just don’t see that many family bikers, tandems and family campers and consequently they don’t understand our per bike instead of per person argument. Because it’s getting more expensive to camp the further south we ride and the camping is also getting worse the further south we ride, camp vs hotel is becoming a purely financial decision for us. If the camping was lovely, secluded and relaxing as it is up North, camping vs. hotel wouldn’t just be an economic decision, we’d also weigh the camping experience. But it’s not, The hiker/biker camping experience in SoCal is pretty sucky. And we’d heard it got even worse, the next couple of campgrounds treated bike tourists like criminal homeless people with curfews and id checks. We’d heard Doheny State Beach near Dana Point even has special check-in/check-out times for hiker/biker. A fellow bike tourist we met in Big Sur told us their hiker/biker check-in/check-out system is reminiscent of homeless shelters, in at 4:00PM, out at 9:00AM, no exceptions. Meanwhile car campers can check in at 2:00PM and out by noon the next day. What’s up with that? Why can’t I sleep as long as the folks arriving on four wheels? Especially since my family paid as much as they did! Since daily camping fees at Doheny, $40 for the family with an additional $25 or $30 for breakfast, we wondered if a $80 a night hotel with free breakfast might be a better plan. So we pulled into a grocery store just outside of Dana Point to figure out where we should stay that night. Stay at Doheny with its rude treatment of hiker/bikers or stay in a hotel with a bed and free breakfast? Same relative cost but not purely an economic decision. Tim started searching various travel sites, looking at available hotels. He came up short, he did find hotels in our price range but when he looked at the reviews, he read horror stories about bed bug issues (ewwww!). Our decision was made for us, and we pedaled over to Doheny to camp for the night. We pedaled up to the campground and found Danielle and Henry’s tent set up in the hiker/biker site. Yay, Danielle and Henry are here! The tiny gravel covered hiker/biker site was located between a bathroom and a chain link fence that separated the campground from the train tracks. Not the best hiker/biker site, pretty cramped with faint bathroom odors, but at least it was clean. We set up our tent, and started working on dinner. Danielle and Henry returned from the beach and we made room for them at the picnic table and sat and chatted with them. We told them our bedbug story and our hotel vs camp decision. They confirmed that the park did indeed have specific check-in/check-out times for hiker/biker. Is this a Homeless shelter or a campsite? After we ate, Tim went to find the ranger so we could pay for the site since we didn’t see a pay booth when we pulled in. Tim was gone for a while and we wondered what happened to him. When he came back he recounted the most bizarre story about his interaction with the ranger. She grilled him about why he was arriving so late, insisting we were supposed to check in exactly at 4:00PM. He apologized, telling her that he didn’t know that rule, we thought it was anytime after 4:00 and since we’re on bikes with kids, 4:00PM arrival was delayed that day. She insisted check-in was at 4:00PM on the dot! She then asked for his id. And when he told her he didn’t have it, it was back at the camp, she lectured him again about breaking the rules. She said she’d stop by later to check our id. Since when is identification required for camping? Weird! We sat at the picnic table chatting with Henry and Danielle and sharing a bottle of wine while the kids read their Nooks with headlamps. At about 10:00PM, the ranger showed up and shined her flashlight in our faces. She asked for identification and was pretty gruff with all of us. I asked if she needed id for the kids, trying my best to hold back all of the sarcastic remarks that were swirling in my head. We’re not criminals, we just ride bikes! She reminded us about check-out, 9:00AM for people arriving on bikes. We tried our best to shake the bizarre and rude interaction and eventually we all headed to bed. We woke in the morning, quickly took down the tent and drank coffee. 9:00 roll out is hard for us! Our kids like to sleep-in! But we did our best to meet the 9:00AM check out time, even though we thought it unfair and rude. Another ranger came by at 8:30 AM — most of the car campers were still sleeping! She had a clipboard with our names, checked us off and told us to leave by 9:00. We tried to strike up a conversation with her to soften her mood and help her realize people on bikes are not to be feared. We’re upstanding citizens and taxpayers, we just prefer to travel on bikes. We pedaled out of the campsite, still shaking our heads in bewilderment. 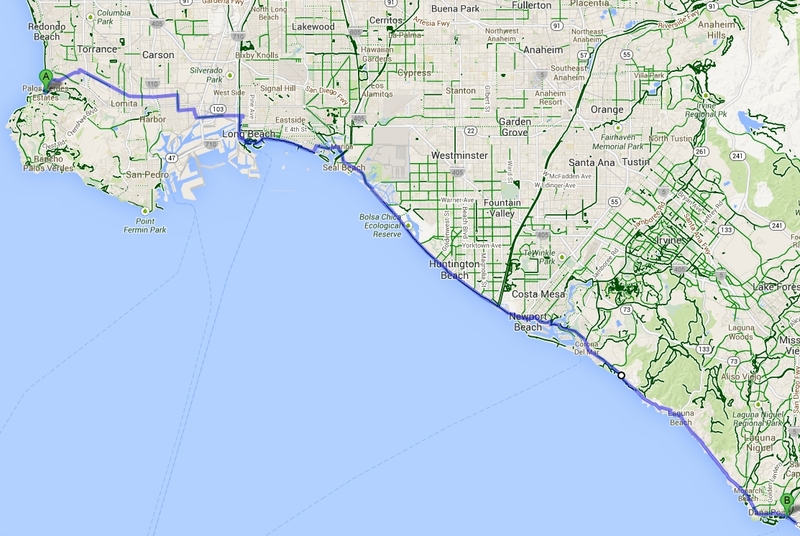 Route: Local roads from Palos Verdes to Long Beach. Then mostly Hwy 1 through a bunch more beach towns. Low: I can’t decide if the low is Orange County aggressive drivers or Doheny State Beach campground. Orange County drivers we encountered were irreverent to cyclists. No specific run-ins, just a lot of speeding and too-close-for-comfort passing. And Doheny State Beach campground treats bike tourists like dirt. Check in at 4:00PM, check out at 9:00AM. Is this a homeless shelter? Random ID checks at the picnic table at 10:00 PM! Just because we arrived on bikes, do you assume we’re criminals? This entry was posted in bikes, Pacific Coast Bike Tour and tagged 2013, acapaccoast, bike touring, bikes, CA, carfreedays, family bike touring, Family Cycling, kids, Pacific Coast Bike Tour, tandem, tandem bike tour, two tandem bike tour. Bookmark the permalink. Thanks for the heads up about Doheny. It wasn’t that way 20 years ago. SoCal just gets more unpleasant as the years go by. that was so sad. how bizarre. 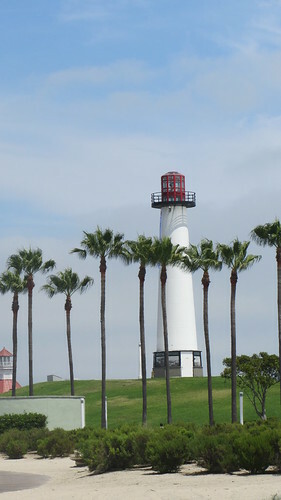 you should contact California tourism. Hi Marge — I plan to contact the State Parks. CA tourism is a good idea too. I told Adventure Cycling about the issues — an org with some leverage might have better luck getting thing changed than me, but I’m willing to try! Tim talked with one of the rangers at a campground. He said that basically CA State Parks are trying to deal with the “homeless problem”. I can think of so many better ways to fix that “problem” than alienating bike tourists! We have stayed on State Parks all along that coast but being on 4 wheels never heard of those stupid hiker/biker rules. What a shame that you had that terrible experience. The only good thing about your story was the bottle of wine. And your friends. And the camera on a stick. I like the camera on a stick. And so of course your photos. So it wasn’t all bad! Yes, so many positives. Wine, good conversation and a lot of laughs. The camera on a stick is fun too. Glad you like the photos!